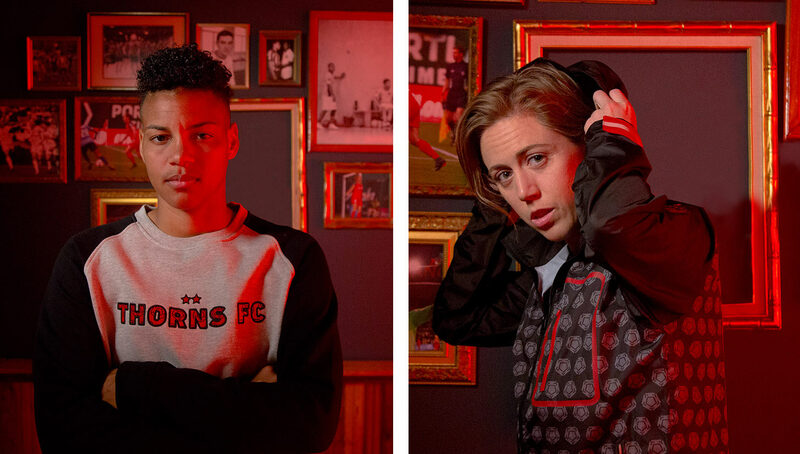 With eye-catching designs and cleverly implemented team features, the Portland Thorns x Live Breathe Futbol official team gear collection is one of the most prominent club-lifestyle brand collaborations we’ve seen, and is certainly the best from a U.S. club. One of the top professional women’s soccer teams in the United States and an extremely passionate soccer clothing company are asking fans a timeless question — would a rose by any other name smell as sweet? 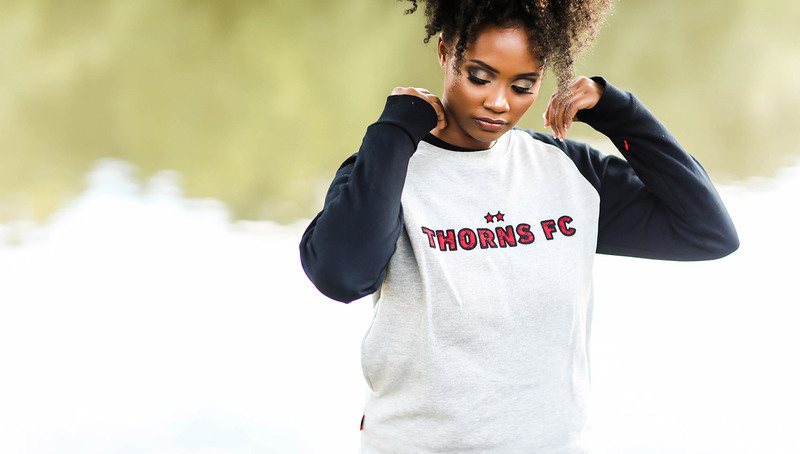 Whether or not you think it does, the Portland Thorns and Live Breathe Futbol are making sure with their new apparel collection that when you think of women’s soccer, you think of the Portland Thorns. 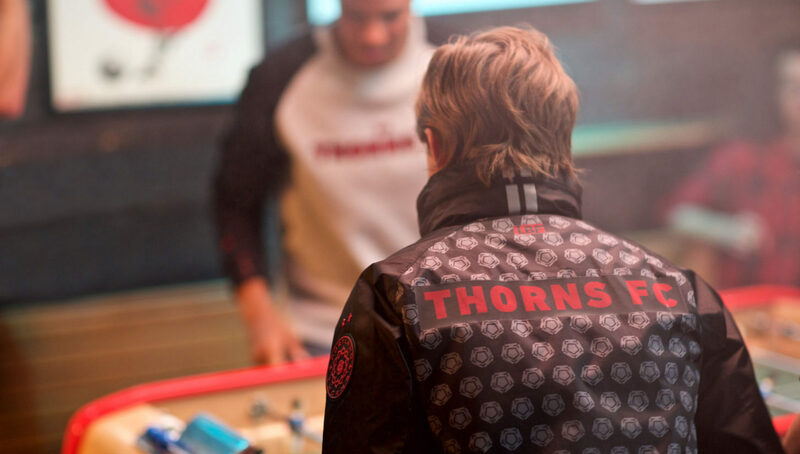 Pulling from a thorn and rose imagery and some good old Shakespeare, the new collection’s official slogan is “By Any Other Name Would Smell As Sweet.” Each piece includes the team’s logo, a thorned rose, in bright red. 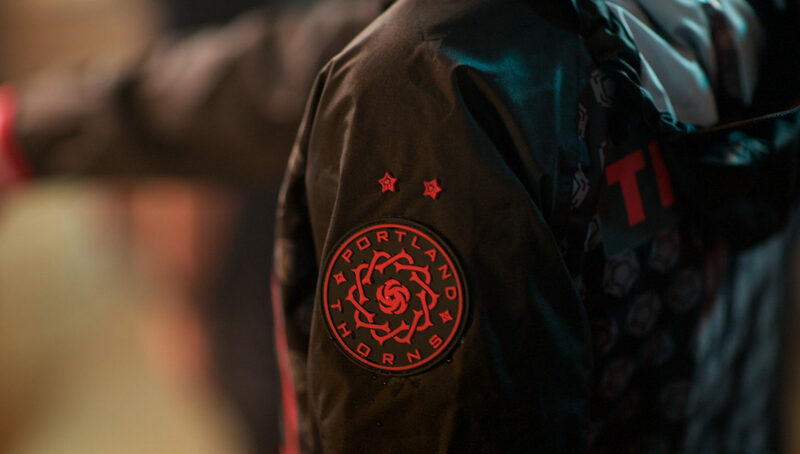 Other designs comprise of a hexagonal grey rose and embroidered double stars, representing the Thorns’ two NWSL championships. The dark blacks, deep reds and tonal grays featured throughout the collection, that includes a men’s and women’s waterproof rain jacket, crew-neck sweatshirt, t-shirt, five-panel hat, and scarf, give it an urban feel that is a departure from the team’s usual style. 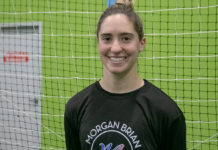 Partnering with Live Breathe Futbol gave the Portland Thorns the opportunity to reach a broader audience. 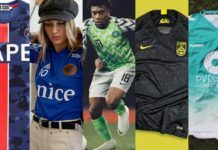 The young and savvy clothing company offers a unique outlook on what soccer fans want in clothing, and their collaboration with the Thorns helped to create apparel that speaks to modern soccer fans, ones who are as obsessive about their sport as they are their lifestyle. 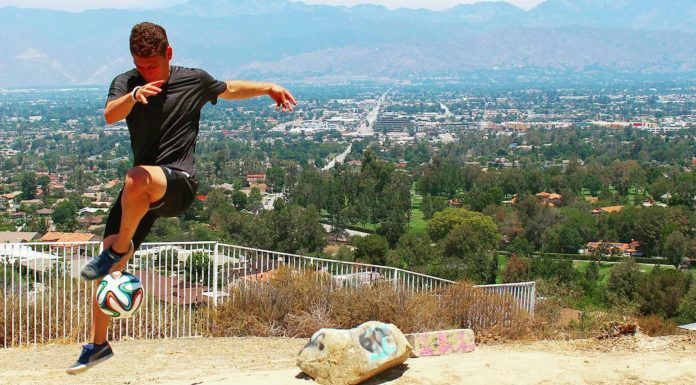 Some of those customizations include the all-over print on several of the pieces, thumb holes, and a foldable hood that fits back into the collar of the rain jacket. The subtle but stylish elements incorporated into each piece gives the fan apparel a unique look while still maintaining functionality. 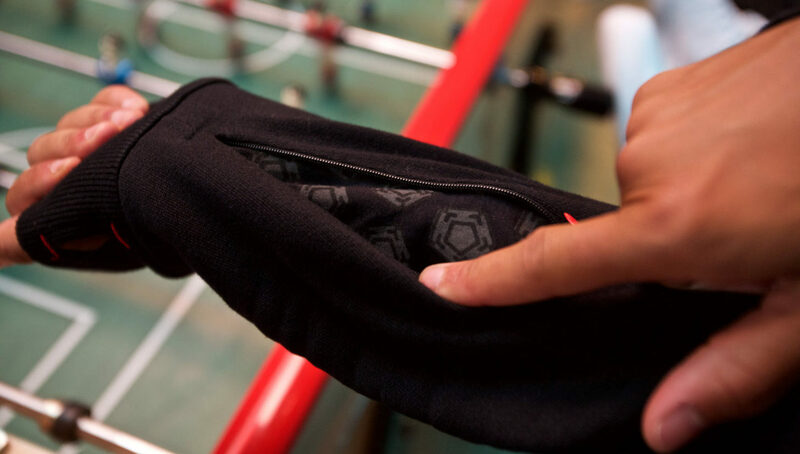 These details make the collection more personal than the average sports team merchandise, making the already powerful connection between the game, its fans, and its most elite players even stronger. 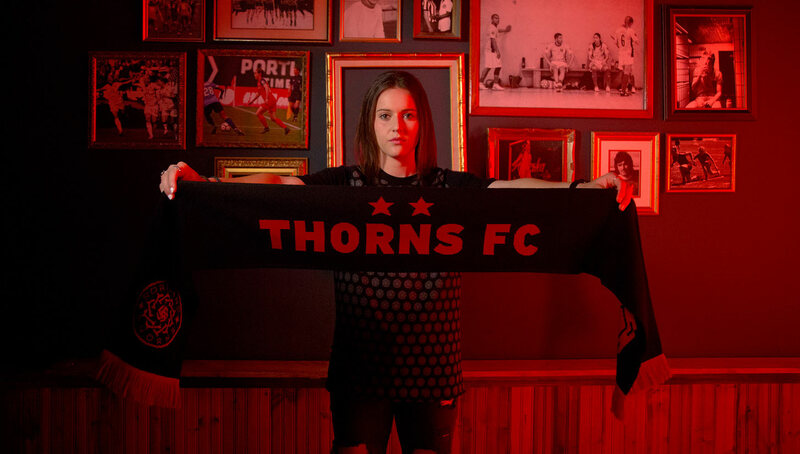 Additionally, the Thorns have the strongest fan base in the NWSL — regularly leading the league in attendance — making them the perfect club for a collaboration of this nature. 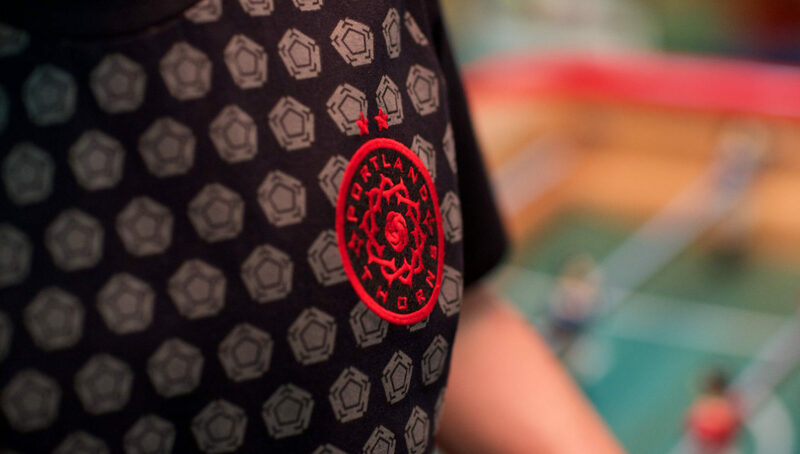 You can pick up the Portland Thorns x Live Breathe Futbol collection at the Thorns and Live Breathe Futbol online shops. 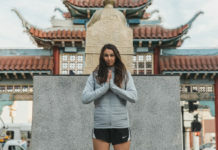 Photos by Craig Mitchelldyer for Portland Thorns FC.